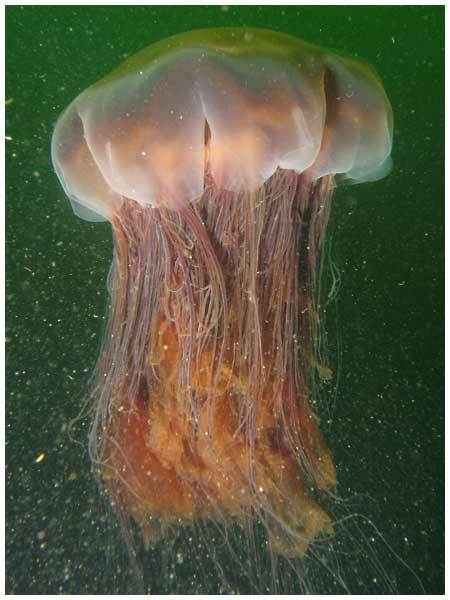 The lion’s mane jellyfish, also known as the giant jellyfish or the hair jelly, is the largest known species of jellyfish. Its range is confined to cold, boreal waters of the Arctic, northern Atlantic, and northern Pacific Oceans. It is common in the English Channel, Irish Sea, North Sea and in western Scandinavian waters south to Kattegat and Øresund. It may also drift in to the south-western part of the Baltic Sea (where it cannot breed due to the low salinity). Similar jellyfish – which may be the same species – are known to inhabit seas near Australia and New Zealand. The largest recorded specimen found washed up on the shore of Massachusetts Bay in 1870, had a bell with a diameter of 2.3 metres (7 ft 6 in) and tentacles 37.0 m (121.4 ft) long. Lion’s mane jellyfish have been observed below 42°N latitude for some time in the larger bays of the east coast of the United States. The lion’s mane jellyfish uses its stinging tentacles to capture, pull in and eat prey such as fish, sea creatures and smaller jellyfish. Most encounters cause temporary pain and localized redness. In normal circumstances, and in healthy individuals, their stings are not known to be fatal. Vinegar can be used to deactivate the nematocysts, but due to the large number of tentacles medical attention is recommended after exposure. There may be a significant difference between touching a few tentacles with finger tips at a beach, compared to an accidental swimming into one. The initial sensation is more strange than painful, it feels like swimming in to a bit warmer and somewhat effervescent water. Some minor pains will though soon follow. Normally there is no real danger to humans (with exception of people suffering from special allergies). But in cases when someone has been stung over large parts of their body by not just the longest tentacles but the entire jellyfish (including the inner tentacles, of which there are around 1200), a visit to a health care centre or similar is recommendable. Although rare, at deep water severe stings can also cause panic followed by drowning. On a July day in 2010, around 150 beachgoers were stung by the remains of a lion’s mane jellyfish that had broken up into countless pieces in Wallis Sands State Beach, Rye, New Hampshire, in the United States. Considering the size of the species, it is possible that this mass incident was caused by a single specimen.